The “16th Asian Games Village 2010” in Guangzhou can be found on the east side of the Panyu district, where the construction of the New City began. The total surface area of the site is 2,737,000 m2. The development of this district is an important part of the “southern expansion”. Existing stadiums were revamped, and the city of Guangzhou was extensively modernised for the Asian Games. 600 million Yuan were invested for the sole purpose of combating the air pollution. In order to provide all athletes, delegates, technicians, journalists and staff of the “village” with environmentally friendly hot water, the planners decided to go with an ELCO solar plant. 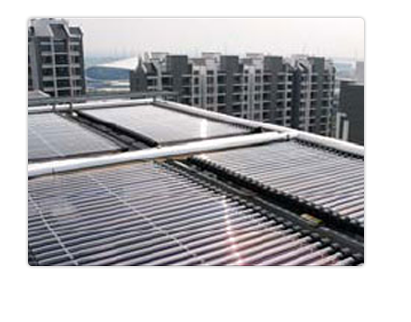 A total of 1,815 AURON 20 DF heat collectors with a surface area of 6,300 m2 were installed. The plant supplies all of the hot water needed daily, and in doing so saves approximately 3,180,000 kWh of electricity and roughly 3,225 tones of CO2 each year.